Q1: Read the introduction. Explain the meaning of "cryptography". A1: Cryptography is the science of secret writing. Q2: Study sources 2, 3 and 4. Describe the method used by Lysander of Sparta and his spies to send secret messages in 405 BC. A2: Lysander of Sparta and his spies had a very clever code system. In the example given five messengers were used to take a coded message to Lysander. Four of the men were captured but their captors thought the message was in the letter. However, the letter was a deception. The real message was carved in code on the man's belt. Even if they discovered the carving on the belt, they would not have been able to read the message. As source 3 points out "written along the length of the belt was a meaningless jumble of letters". Source 2 explains that the sender of the message wraps the belt around a wooden staff (scytale) and writes the message along the length of the belt. When he unwinds the belt, it appears to contain a list of meaningless letters. When the messenger arrived at the camp of Lysander the belt would be wrapped around a scytale of the same diameter as the one used by the sender. Lysander would then be able to read the message (see source 4). 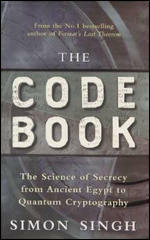 Q3: Read the introduction and source 5 and explain Julius Caesar's secret code. A3: Julius Caesar sent messages to his fellow commanders in a code that they had agreed before the battle took place. Caesar's code simply replaced each letter in the message with the letter that is three places further down the alphabet. Q4: Use the Julius Caesar code (source 6) to translate this famous quotation by the Roman leader. A4: "As the sailor avoids the rock, so should the historian avoid the word that is obsolete or rare." Q5: Cryptanalysts use several methods to break a code like the one used by Julius Caesar. One is to look at the frequency of the letters that appear in the message. For example, the commonest letter in English is "e". This does not always work in short messages but is an excellent way to help break the code of a long message. Another way is to look at repeating words. The message above includes the word "WKH" three times. It would not take an experienced code-breaker long to realise that "WKH" represents "the". The codebreaker could then use this clue to work out the relationship between these letters (the letter is being replaced by the letter three places further down the alphabet). Another three letter word that often comes up in messages and is often worth investigating is "and". Another common method used by cryptanalysts is to look for a word that is likely to appear in the message. This is true for this message sent by Julius Caesar to his calvary commander during a war against German tribes. Can you break this code? A5: The code is the alphabet written in reverse order. Therefore, A becomes Z and B becomes Y. The key word in the message is "German". There are only two six letter words in the message - ZGGZXP and TVINZM. Next you have to find "the" in the message. There are two three letter words - GSV and ZMW. If GSV is "the" than "e" is V. As the second letter in German is "e" than TVINZM is German. You now have the following information about the message: (T = G) (E = V) (R = I) (M = N) (A = Z) (N = M) (H = S). By studying this list you might notice two clues (code-breakers call them cribs). A = Z (the first and last words in the alphabet). Another clue is that M = N and N = M. M is the thirteenth word in the alphabet whereas N is the fourteenth in the list. If you reverse the alphabet you can work out the rest of the message. "Attack the crowd of women and children in the German camp."